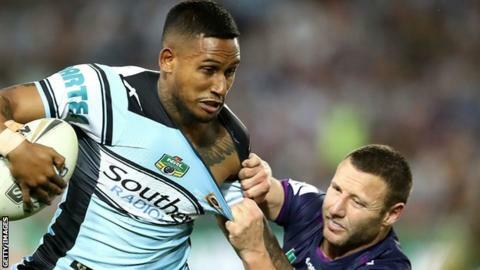 St Helens full-back Ben Barba says his 12-game suspension from rugby league after a positive drugs test has helped him appreciate his career. Barba left the code and Cronulla to join French rugby union side Toulon for 2017 on the back of the ban, but ended his stint in May when he joined Saints. Having seen out the ban, Barba, 28, is ready for Friday's debut against Wigan. "What I've taken from it is how easy things can be taken away from you," Barba told the BBC Super League Show. "It's been quite a ride. I'm now on the other side of the world and playing in a different competition, but I'm grateful to have the people around me and the family that I do." The disappointment of Barba's ban from rugby league came on the back of a historic National Rugby League premiership win for club side Cronulla - their first title in 49 years. Barba scored 16 tries in 27 games for the triumphant Sharks, including one in the Grand Final against Melbourne Storm. "I've gone from playing footy every week, to having to sit out for such a long time," Barba continued. "I've obviously put myself in that position with the drug testing but all I can do now is work hard and try to put some good performances on the field." Saints head coach Justin Holbrook took the decision to add Barba to his squad, having worked with him before at Canterbury Bulldogs. Holbrook said he was delighted to sign a player who less than 12 months ago was at the top of his game in the elite NRL. "Everyone knows he can score tries, but it's the way he reads the game," he added. "We don't have too many naturally talented players who have that vision in our game in the world, he's got that and experience, good at organising, he brings a lot of things." Friday's derby against Wigan is a crucial fixture for both teams in the race for a semi-final spot and the opportunity for Barba to go back-to-back in terms of premierships. Only points difference in favour of Saints separates them and Wigan on the ladder, with Wakefield above them in fourth currently in possession of a play-off spot. "I think we've got the side to do it," Barba continued. "We've got experienced guys and young guys who are playing unreal at the moment. "Hopefully we've learned over the last couple of weeks and put our best foot forward the next couple."